On July 20 at San Diego Comic Con, actress Melissa Joan Hart (best known for her work on Sabrina, the Teenage Witch and the sitcom Melissa and Joey) and her producing partner (and mother) Paula Hart [among others] participated in a panel focusing on their upcoming new project from their Hartbreak Films production company: The Watcher in the Woods. This new take on the book by Florence Engel Randall and the 1981 Disney film, which starred legendary actress Bette Davis, will air on Lifetime this Saturday, October 21. In this new version Academy Award winner Anjelica Huston takes on the role of Mrs. Alywood, the distraught mother whose daughter, Karen, vanished in the English countryside 36 years ago. Jan Carstairs (relative newcomer Tallulah Evans) and her family move into the idyllic Alywood manor for the summer. Upon arriving in the small village of Northrop, the family is warned against entering the surrounding woods, but Jan and her little sister Ellie (newcomer Dixie Egerickx) hear voices coming from the forest. Strange occurrences begin to unnerve the family and Jan begins to suspect that they are linked to Karen’s disappearance. As Jan unravels the dark past hidden by the townspeople, she delves further into the mystery and deeper into danger, but now it might be too late to escape the Watcher in the Woods. Melissa not only served as executive producer alongside her mother, but she also directed the film, which has been a passion project of hers for the past 20 years. In a special roundtable interview with the press, Melissa and her mother as well as writer Scott Abbott and associate producer Andrew Gernhard shared details about the reimaging of The Watcher in the Woods. What inspired you to reimagine The Watcher in the Woods? Melissa: I was obsessed with the 1981 movie. I watched it over and over again with my family. When we were doing Sabrina, (we were constantly) looking for projects to do when I was off from the show. Paula: At the time, Melissa would have been perfect for the part of Jan.
Melissa: (Mom) tried getting the rights for 17 years and we finally got Disney to give us the rights to let us do it, but at this point I was too old to play Jan and too young to play Mrs. Alywood. Melissa: Then I was going to play the mom, but I really (didn’t) want to have to act AND direct so we ended up finding a really wonderful woman (Melanie Gutteridge) to play the mom and I didn’t have to do it. What are the things you most wanted to use in this reimagining? Scott Abbott (Writer): The first thing I wanted to preserve was the story itself. It’s a gothic story; it’s really a ghost story. The biggest concerns I had were, “Who is the Watcher?” “What is the Watcher?” and “What does the Watcher want?” Another thing I wanted to observe was (the) tone. (I wanted) to tell a straight gothic story. I didn’t want it to be a tale full of blood. I wanted it to be a tale of suspense. Melissa: I think one of the things that Scott did that was so great, he really preserved (the) family aspect. (He also made) the Watcher be his own character (and that is the one major difference (from the movie and the book). I think he did an amazing job streamlining the story and making it clear who the Watcher is, what it wants and what’s going on. You’ve got Anjelica Houston and some talented newcomers playing the kids. Can you talk a little about the casting process? Melissa: And I freaked out. And (then) I (got) to direct her. We did casting in London and even some of the day players are people from Downton Abbey and Doctor Who because we filmed in Cardiff. But we cast in London and they were an amazing cast. They were all so easy to work with. Everyone gave 110 percent. Paula: Everybody auditioned…no matter how small the part was or how big the actor was, they all auditioned. NOTE: It should be noted that actor Benedict Taylor, who played Mike Fleming in the 1981 movie, plays John Keller – the grown version of the teenager who was in love with long missing Karen – in this new version. It should also be noted that Huston was the only American actor, playing a character with a British accent, while many of the British actors in the cast were playing Americans. What was your favorite part of this version? Melissa: Everything. It was really fun. It’s been fabulous. It’s an actual dream of mine. This has been going on for almost 20 years for us. So this is something – to finally get it done. This is a dream come true. Scott: I learned a lot about the process from working with Paula and Melissa. Andrew Gernhard (Associate Producer): We did all the post-production. We loved every minute of it. From the rough cut to the color correction to the special effects. It was just cool to get to recreate the 1980’s to something that was new. 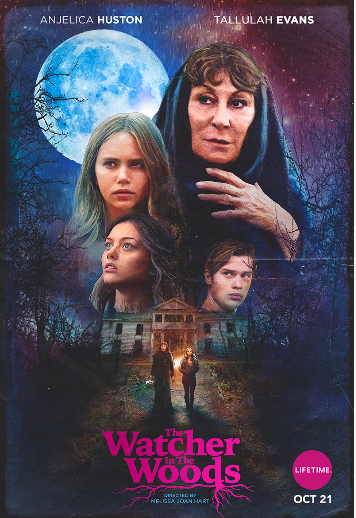 The Watcher in the Woods will debut on Lifetime on Saturday, October 21 at 8/7c. Most TV viewers will recognize actress Sarah Lancaster from her roles in the acclaimed TV series Everwood as well as the fan favorite dramedy Chuck, but she actually got her start in television via the youth-oriented series Saved by the Bell: The New Class for which she appeared in from 1993 to 1996. Since then she has appeared in a number of made-for-TV movies such as Fir Crazy, Love Finds You in Sugarcreek, Looking for Mr. Right, Along Came a Nanny, Christmas in the Smokies and ‘Tis the Season for Love. Tomorrow, October 6, her latest movie – The Stray – will be hitting the big screen. 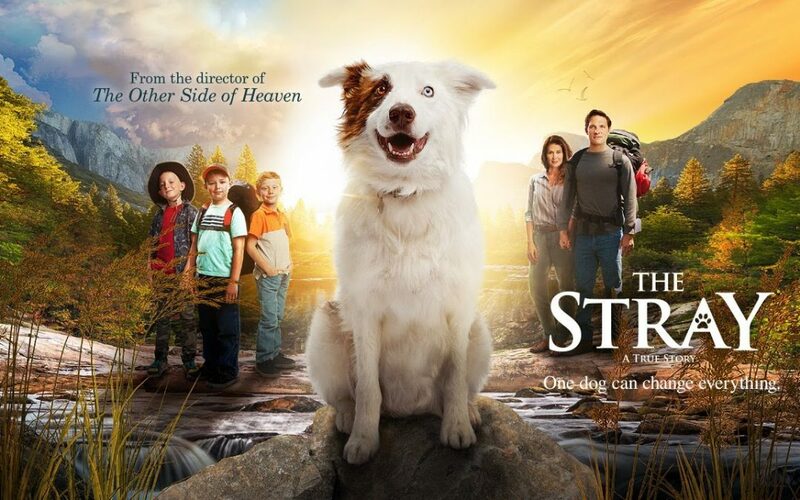 The inspirational film tells the true story of a stray dog who saves a struggling family in more ways than one. Pluto comes out of nowhere and quickly makes himself at home with the Davis family, who are on the brink of falling apart. Dad, Mitch Davis, (Michael Cassidy from The O.C. and People of Earth) is a career-driven workaholic who is neglecting his marriage and family. 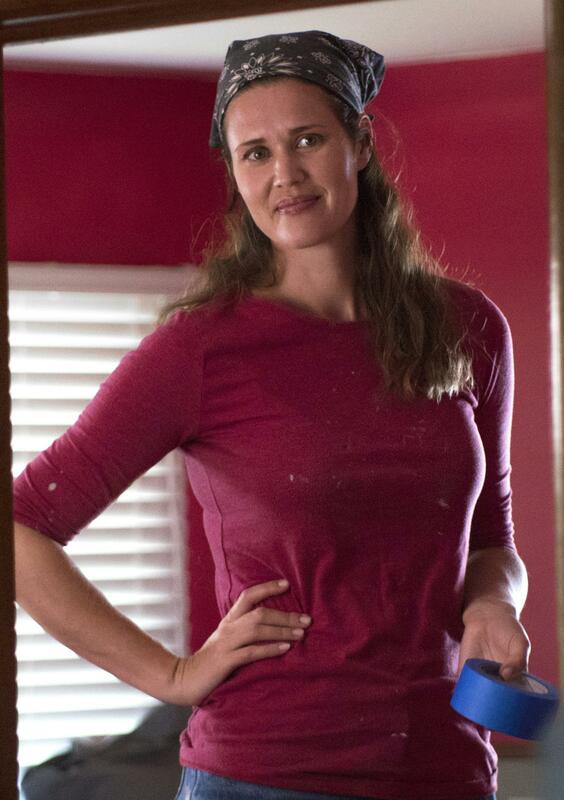 Mom, Michelle Davis (Sarah Lancaster) is at her wit’s end raising three young kids. The last thing they need is another mouth to feed. In just a short time with the Davis family, Pluto the wonder dog manages to save a lost toddler, bring comfort and companionship to a hurting 9-year-old boy (Connor Corum from Heaven is for Real), help restore a marriage, and repair a broken father-son relationship. Pluto is not only a guard dog – he’s a guardian angel. The film is written and directed by the real life Mitch Davis (The Other Side of Heaven). Question: What was it about Michelle Davis and the theme of the movie The Stray that drew you to the role? Sarah: I’ve never played a real life person before, that came with its own set of responsibilities and I hope I do her justice. She’s no wallflower. She’s the driving force behind the family. I love that. Question: It is said that working with kids and animals can be a little difficult. Did you find that to be the case with this film? Sarah: There are, of course, certain challenges; but you also always stumble upon magic with kids. It can be trying, but really special at the same time. I think I found it difficult before I had children, now that I’m a mom … bring it on. Question: Can you share a sneak peek at one particular scene from The Stray that moved you the most or was the most challenging to film? Sarah: Without giving anything away… there is one particularly emotional scene for my character and the real life Michelle was there that day while we we’re shooting. I tried to sort of stay in my own space until I was done with the scene so I didn’t get in my head about getting it right for her. Afterward I went by the monitor and saw that Michelle was crying too. It was a special moment. Question: How much research did you do for your role in The Stray or did you have the opportunity to spend time with the real Michelle Davis to prepare for filming? Sarah: Michelle opened up her home and we got to spend a bit of time together before filming. The Davis’ in general we’re always around set, it was really a family affair. They are a remarkable family and it was a treat getting to know them. I was quite homesick… and sick sick during filming since I was 10 weeks pregnant. I didn’t tell anyone on set at the time that I was expecting. But the way the Davis’ took us in, it was really special and helped ease that ache I had to be home with my boys. Question: What message do you hope viewers of The Stray will take away after seeing the film? Sarah: I love the idea of a fresh start. Second chances. This film speaks to that… it’s never too late the lead the life you want to live. And family, of course is everything. Question: What is the one thing your fans would be surprised to learn about you: a hidden talent? a favorite charity you support/believe in? or something else? Sarah: If I listed my current interests I’d sound like a little old lady. Actually some of my friends call me “Betty” that’s the grandma in me. Betty Lancaster at home baking, reading and going to bed at 9. The Stray will open in select theatres throughout the country tomorrow. You can check the movie’s official website for tickets. With the season premiere of Merlin airing tonight on Syfy, fans might find it interesting to get an inside look at the main cast of the popular series before the big event happens. Question: (This season) Morgana is the villain, but she didn’t start (out) that way. How do you create some form of humanity or sympathy for such a wicked character? Katie: It’s fairly easy for me because ultimately I believe in what she’s doing and why she’s doing it. She’s been betrayed by her father, ostracized from her family and she’s all alone. She’s running on pure revenge, pure adrenaline fueled by pure revenge. I do feel sorry for her. Question: Has Morgana’s appearance also made the transition to evil? Katie: (She) now kind of looks like a Goth Jessica Rabbit. She is the character that (has) really changed the most…it’s a massive transformation. Question: This season continues down a darker, more dramatic path. Do you feel the show is following a natural evolution? Katie: The co-creators (Julian Murphy and Johnny Capps) have found a formula that works and they have taken it to the next level with this season. The show still has all the great comedy and relationships that the audiences adore, but we’ve gotten more sinister and the show has gotten there in a very organic way. Question: Morgana presents the greatest threat to Camelot, correct? Colin: Yes, she is desperate to claim the throne, and the only person standing in her way is Arthur. She is absolutely power hungry, fixated on regaining Camelot. She is Merlin’s ultimate enemy. Question: What is Arthur and Merlin’s relationship like now? Colin: They are master and servant, but they have also always been friends. They can’t help but like each other for their own quirks. What is different this season is that you see a vulnerable prince making use of Merlin as an advisor. Question: Is Arthur still in the dark about Merlin’s magical power? Colin: Yes, Arthur still has no idea about Merlin’s magic. If Merlin revealed his power to Arthur now, he could risk everything. Merlin’s dream is to live in a land where he can be free and ruled by the greatest king the world has ever known. But right now it would be madness for him to risk that for the selfish reason of revealing himself. Question: What has happened to Arthur since the last time we saw him? Bradley: Arthur has to take the responsibility for the kingdom on his shoulders because his father has lost his mind. All eyes of the kingdom are now upon him, looking to him, not to Uther. Morgana poses an enormous threat to the kingdom Arthur is trying to protect. He has been thrown into the deep end of a very grave situation. Question: How does Arthur cope with this responsibility? Bradley: It’s not always easy for him, constantly learning lessons from his mistakes. But he’s the man you would want in a crisis because he always sticks by what he feels is right, which is a very good quality. Question: Has this changed the relationship between Arthur and Merlin? Bradley: Their friendship has grown, and Merlin comes up with pearls of wisdom more and more often. It’s harder for Arthur to turn those into a joke and pretend Merlin is just being stupid. They are now forming a much closer relationship. Once again, tune in tonight at 10 PM for the return of Merlin on Syfy to find out just what happens next for Merlin, Arthur and Morgana. This past April I had the opportunity to attend Wonder Con, which is an annual pop culture convention held in San Francisco and is the precursor to the San Diego Comic Con. As part of my press duties for this convention, I was invited to participate in round table interviews with some of the actors and creative team behind the upcoming box office film Immortals, which will be hitting cineplexs on November 11. The members of the cast in attendance included actors Luke Evans (Clash of the Titans) and Henry Cavill (The Tudors) as well as actress Isabel Lucas (Transformers 2). Director Tarsem Singh and producer Mark Canton were also on hand to discuss the film. The basic premise behind Immortals is that King Hyperion (Mickey Rourke), mad with power, has declared war against humanity. The king has amassed a bloodthirsty army, scorching is way across Greece in search of a weapon of unimaginable power that was forged in the heavens by Ares himself. The one who possesses this weapon can unleash the Titans. If this weapon ends up in the king’s hands it will rain destruction on mankind and annihilate the Gods. Ancient law dictates the Gods must not intervene in man’s conflicts and they are powerless to stop the king until a peasant named Theseus comes forth as their only hope to defeat the king. In the hands of visionary director Tarsem Singh, the man behind the independent films The Cell and The Fall as well as the upcoming Snow White film that stars Lily Collins and Julia Roberts, Immortals will assuredly be vividly dynamic in color and scope. Singh himself is a man in motion, never sitting still and is very animated. He displayed passion for his craft and excitement for his work. On the reverse side was producer Mark Canton who was calm and sedate; explaining the differences between Immortals and the film 300 was the approach to filmmaking as overseen by Tarsem. And, he raved about actor Mickey Rourke’s portrayal of the power-hungry king. “He is fierce in the movie; wind him up and get out of the way,” Canton explained. As for the actors, the very soft-spoken Isabel Lucas seemed hesitant to answer questions almost as if she preferred being a bystander than in the spotlight; but she did share that filming the action scenes for which her character Athena participated in were hard, especially the rehearsing beforehand. Actors Luke Evans, who plays Zeus and Henry Cavill, who plays the lead role of Theseus, both agreed the training for the film was difficult. In fact, Evans shared the training “changed me physically forever”. When asked what it was like working with Mickey Rourke, Cavill shared that “you can learn so much from just doing a scene with him”. Both actors also felt the pressure of their next high-profile roles – Evans plays Aramis in the recently released The Three Musketeers and, of course, Cavill was cast as Superman/Clark Kent in the reboot of the franchise called Man of Steel that is filming right now but won’t be out in theatres until 2013. If you are a fan of the “sand and sword” type of films, Immortals will be just what you are longing to see. Again, Immortals will open in theatres on Friday, November 11. Here is the trailer for Immortals. Young adult fiction. Those are three of the hottest words in the publication world especially given the box office successes stemming from the Twilight Saga novels and the Harry Potter juggernaut as well as the worlds of The Vampire Diaries and Pretty Little Liars that have been turned into TV gold. In what I hope will become a regular feature here at Rueben’s Ramblings, I will shine a well-deserved spotlight not only on well-established writers but exciting up-and-coming novelists in the world of young adult fiction and delve into the interesting worlds for which they have created. Question: What inspired you to write your books? Stacey: I guess I write the stories I want to read. I love young adult novels, and I was intrigued by the idea of a romance between people who are total opposites, in every way, including life/death status. Question: How long was the story in development and how long did it take you to write each book? Stacey: I don’t outline in any kind of formal way, but it takes me about a month or so to kind of wrap my head around the characters and the story and where it’s going. I need to know the end before I can start. Each one took between three and four months to write. Question: What inspired you to become a writer? Did you always know or did the interest come at a later time in your life? Stacey: I’ve always been interested in storytelling (but) it took me awhile to realize that it was something I could try in book form, though. I didn’t seriously start trying to write a book until after I graduated from college. Question: What was the most difficult scene to write in either book? Stacey: Oh, I think the end of Queen of the Dead was tough. It was emotionally difficult for the characters (and for me) and just a tricky scene to manage for a lot of different reasons. I can’t explain too much more without spoilers! Question: Can you please provide a general premise for each book? Stacey: The overall premise of the series revolves around two characters: Alona Dare and Will Killian. Alona Dare is part of the popular crowd, the girl everyone wants to be: Captain of the cheerleading squad, Homecoming Queen, and kind of a mean girl. And then she dies in a rather abrupt fashion–death by school bus. So, now she’s a ghost, trying to figure out why she’s still here instead of moving on to the light. Will Killian is a ghost-talker, someone who can see, hear and touch ghosts, and it makes his life miserable. He’s a social outcast, the school weirdo. He’s just trying to make it through high school without being kicked out or locked away in a mental institution because everyone thinks he’s crazy. The first book, The Ghost and the Goth, is about Alona discovering that she is, indeed, a ghost and she’s stuck in a place in between the living and the dead. Will is just trying to get by. His principal is out to get him, and his psychiatrist thinks he should be locked up. The last thing he needs is another ghost–particularly a very persistent one–pestering him. But Alona is in danger of disappearing for good, and he’s the only one who can help. So the two of them, with all their bickering and name-calling, have to figure out a way to work together. In the second book, Queen of the Dead, Will and Alona have figured out how to work together and they’re both struggling a little with feeling more for each other than they should. Then a new ghost-talker, Mina, shows up on the scene, claiming to have more information about Will’s dad, who died years before. Alona doesn’t trust her, but Will is intrigued. And Alona has her own problems with her still living family–they’re moving on with their lives without her. All of this sets Will and Alona more at odds with each other than ever. And when they’re not working well together…well, it causes all kinds of problems, some of which cannot be easily remedied. Stacey: That’s like asking me to pick a favorite child, but I will say that, in terms of writing, Alona is a lot of fun because she has a very distinct voice and she doesn’t hold back. And as a writer, sometimes it’s fun to really let loose! Question: Will you be writing more books in the series? Stacey: One more book in this series, and then I have a new series starting in 2013 with The Rules. It’s about a girl who was raised as a genetic experiment hiding from her creators under the guise of being a “normal” sixteen-year-old, and the boy who tempts her to break the rules that confine her existence and keep her safe. Question: If a movie were adapted from the book, which actors/actresses would you like to see play the primary characters? Stacey: The models on the cover are pretty much exactly how I pictured Will and Alona, so I’d love for that to be the case with a movie as well. Readers have suggested actors for Will (Landon Liboiron from Terra Nova or Jeremy Sumpter from Friday Night Lights), but I haven’t heard any suggestions for Alona yet. SECRET REVEALED: Here’s a little behind-the-scenes trivia: Alona is named for the wonderful actress Alona Tal, after I saw her in (the TV series) Veronica Mars as Meg. Question: When is your next book coming out and will it be a continuation of the first two books? Stacey: The third and final book (to be called Body & Soul) in the trilogy will be out in May of 2012, and it’s definitely a continuation of the first two books. Question: Do you have a favorite story arch or favorite character? Stacey: You know, Liesel and Eric (secondary characters in the first two books) were so much fun to write especially in the scenes where Liesel and Alona argue. Actually, thinking about it, I really loved writing all of the ghosts. It was fun coming up with their individual backgrounds and deaths. Question: Were any of the characters modeled after you or anyone you know? Stacey: Every character, I think, always has a piece of the writer in him or her. But, no, the characters aren’t based on anyone in real life. Question: Are there any story arcs that you ended up not using in the book? Stacey: I toyed with the idea of Will’s father’s death being murder, but it added an unnecessary layer of complication and I felt it didn’t resonate with the rest of the story as well. Stacey: Don’t give up. It’s really easy to begin doubting yourself, but believe in the story and your passion for telling it. Question: If you weren’t a writer, what would you be doing? Stacey: Assuming my non-existent training wasn’t an issue? I’ve always been interested in archeology; however, the dirt and sleeping in tents aspect does not appeal to me. Question: What book(s) are you currently reading? Stacey: Right at this very second, I’m reading The Forgotten Garden by Kate Morton; but when I’m not deep in writing mode, I often go through two or three books a week. Question: Who is your personal favorite writer? Stacey: Oh, that’s a tough one. I have so many! My mentor and critique partner is SF/F author Linnea Sinclair. I’ve learned so much from her. I also greatly admire Meg Cabot, Jennifer Echols, and Suzanne Collins. Jane Austen is my all-time favorite. Question: If anyone would like to get in touch with you both, where should they write, email, tweet and do you have a website dedicated to the book (or any of your other work)? Stacey: I’m on Twitter (waaaay too much) and you can find me there as @staceykade. I’m also on Facebook (facebook.com/staceykade), and I have a personal website with an email/contact form here. Make sure to check out Stacey Kade’s books the next time you are at your local bookstore, visiting Amazon or whatever book outlet you prefer; and make sure to pick up the third book in her trilogy (Body & Soul) when it is released on May 29, 2012 and be on the look-out for new trilogy The Rules in 2013. Imagine you have an endless supply of cash, wealthy behind all imagination, and you fund a program where you can do anything, be anyone and go anywhere – that is Project: Elysium. But, as Alaster Stone (Kevin Herrera) – the man behind and within that program – quickly learns from a scientist named The Consultant (Meaghan MacLean), he can’t be extracted from that well-crafted world. How much will he sacrifice to have it all? That is the interesting premise of the new short film by up-and-coming, young director Devon Newberry. Coming off an incredible response to a private school screening of the short film at the CSU Long Beach Spring Showcase in May and after having the film selected into the 15th annual LA Short Film Festival last month, Project: Elysium will be available for viewing online tomorrow Tuesday, August 9. Question: What was the driving factor behind your making this film? Newberry: I was looking for something to direct, as it had been a few months since I directed a short called “See Ryan”. My good friend and one of my producing partners, Aaron Rubin, presented me the script for this movie, asking me to only do rewrites. After I wrote a couple drafts, I sort of, subconsciously, geared my rewrites as a directorial vehicle for myself. I was fortunate enough that after I did my pitch with Michael Demas, who wrote the original idea and the first draft, he was comfortable enough to let me direct. Aaron Rubin was on my side the whole time and played a role in planting the seed to get me in the directing chair, but I think it came down to the pitch between Demas and I. Question: What was the hardest aspect of filming Project: Elysium? Newberry: Honestly, it was a breeze. I thrive on high-pressure situations and with Elysium, it was my first ‘big-budget’ short. There are a lot of visual effects. We had a lot to shoot in a very short amount of time, and we were fighting nature. It was probably a nightmare for the production team, but I just move in stride and work as I go. We shot under schedule and initially shot under-budget; it ended up being a really smooth shoot. I think the pace at which I shoot was new for the crew, as a lot of the team was new and hadn’t worked with me yet, but Luke Dejoras and I, my director of photography, run-and-gun. Luke is one of those guys who can shoot at whatever speed is presented, but I rarely do more than four takes and I try to shoot as much as possible, as fast as possible. It’s a lot of fun. Question: How long did it take to film and then work on post-production? Newberry: I was hired to direct the film in October 2010, and I initially wanted to shoot in December 2010, but (realistically) there was no way (that) was going to happen. I cast the film before the New Year, but my team and I didn’t start official pre-production until January 2011. We were scheduled to shoot in February; but, of course, on the weekend we were scheduled to shoot, we got rained out – and the movie is 95% exterior. We ended up shooting the film in March and had a REALLY quick turn-around to hit some festival deadlines. My wonderful editor, Aaron Robinson, cut the film, did all the VFX – all that jazz – in six weeks. It was pretty extensive. He did an incredible, incredible job. Question: How long were you in development, putting the script and pre-production together? Newberry: We spent 5 to 6 months preparing it from first rewrite to day one of production. It didn’t take too long. It was just a matter of putting the pieces together. Question: Was the casting process easy or hard? Can you elaborate on that whole process? Newberry: For me, it’s easy. I’m a big fan of the actors I’ve worked with and I’m always interested in working with first time actors – which is one of those high risk/high reward actions, as it’s terribly easy to cast a dud – so I cast based off reels, looks, motivation, etc. I had told Kevin [Herrera] about the script and told him I wanted him to play Alaster Stone well before I signed on as director, and the cast fell in place from there. I had wanted to work with Meaghan [MacLean] for a couple of years prior to this and immediately brought her on, then Ron Drynan and Rupa Shah came pretty quick. Funny thing about Rupa, she was cast two days before production began. We started shooting on a Friday and on Wednesday night she confirmed that she was in. The original actress cast to play The Woman had to drop out due to scheduling conflicts, so a little bit of improvisation was required. I think it worked out for us. Question: What was the inspiration for you to want to become a director? Newberry: There were a (number) of factors, all entertainment based, that eventually led to directing. I wrote and directed an awful, awful play in junior high that got a standing ovation and an A+ in the class. But in retrospect, it was a pretty goofy, Lord of the Rings-inspired play. So that kind of kick-started it. I went on a tram tour at Universal Studios one day and saw the set where a big truck collapses through the roof into the subway and water pours from the side and thought, “Man, I really want to build sets… so I can destroy them!” But that only lasted so long, as I’m awful at math and anything that requires a hammer. (Instead I) started making movies and felt 100 percent comfortable and confident in what I was doing. Question: What is the best advice you can provide other young directors? Newberry: Make YOUR movies. Make the movies YOU want to make. It’s easy for young filmmakers to try to make movies (like those) of the directors that inspire them or make movies they think people want to see, but they really need to be thinking about what they want to see. If you’re confident in what you’re doing, in the movies you’re making, the audience will be able to tell. There’s nothing worse than seeing an inconsistent movie because the filmmakers weren’t sure what they wanted to do. I can’t be the next Christopher Nolan, Michael Bay, Steven Spielberg, etc… but I can be the first and best Devon Newberry possible. That’s all I can do. Question: Can you share any details on your next film? Newberry: I start shooting a small, pseudo-indie short called Phynes with actor Dominick Aznavour on September 2. We’re shooting on a shoe-string budget – MUCH smaller than Project: Elysium – and we’re hoping to show it in January. It should be done by then, (and) there’s only one VFX shot. Otherwise, it’s all character. I have plans after that as well. When I was rewriting Project: Elysium, I had a trilogy in mind. I wanted to be able to one-off the first film in case people didn’t respond well to it, but I wanted to continue Alaster’s story if the audience wanted to see more. I can confirm that Project: Elysium 2 is deep in the writing process and some early prep has begun. I can also confirm we’re doing tests to see if we can shoot it in 3D – which would be totally new for us – and I can confirm we’re going to raise the bar. It’s going to be exciting. Question: Where is the best place for fans to reach you, learn more about your work and upcoming projects? Newberry: I’m all over the place. I have an “official site“. I’m on Facebook (he can be found under Devon Newberry there), I do the whole Twitter thing (he can be found @DevonNewberry), I email. I love feedback – good AND bad – so I encourage people to (reach me by any of those means) to say how much they loved or hated what I do. My team and I can’t get better if no voices are heard, SO BE LOUD! With those thoughts in mind, make sure to check out Project: Elysium when it goes live online tomorrow August 9, get in touch with Devon with your thoughts on the film and keep an eye out for more of his work next year. He is definitely a director and writer to be on the lookout for in the future.